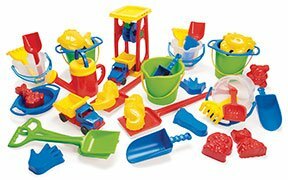 This 38 piece set has everything needed for sand and water fun! Shovels, rakes, buckets, wheels, and more will keep kids busy at the sensory table or on the playground. With enough items for a group of children, this set is perfect for the classroom. Grades Pre K , Ages 1.5 .